Back from one of my favourite places in Wonnangatta-Moroka: six hours walk in from my car & five hours drive from here to the closest driveable location. This has to be one of the remotest areas in Victoria. Deer (and dingoes!) as common as rabbits elsewhere. Took our old Jack Russell, Tiny along for the walk. Turns out she is fitter than me and was still keen to hunt after six hours’ walking. It also turns out that deer are utterly mystified by Tiny whom they honk repeatedly at whilst ignoring me utterly, whilst presenting (to me) perfect targets. Just had to shoot one, the dog promptly buried bits of it all over the bush, just in case she should pass this way again. At about 14 years old this becomes increasingly unlikely. TWICE we figured packs of dingoes were hunting us: about 8:00pm on Friday night a pack came barking down our back trail from up river and had deer honking at them at about 30 yards out in the dark, (and me only having four shots in these ‘new’ John Howard mandated rifles – and my trusty machete). Figured we could take about five of them. This pack must have picked up on an orphaned calf and clearly made their kill about 200 yards up the hill behind the camp from where they set up the most infernal howling for hours! That, and a sudden wind change and downpour made it hard to sleep. As we were walking out on Saturday another pack were again seemingly hunting our back trail this time led by what sounded like a bloodhound cross from the baying (MOST unusual for a dingo – these wild dogs have crossed with who know what other nasty breeds and are no doubt becoming more dangerous. Note to self: take more ammo next time). Fortunately they picked up the scent trail of a stag I had previously had two shots at (but been unable to locate in a hundred hectares of man fern – worse luck). The pack located him though! Better than eating us I suppose. PS: On a later trip I did find some of the bones the dingoes had picked over but failed to locate the rack. Let me know if you find it! Tiny loves my sleeping bag. She also loves deer. ‘Yum’! Wow – so much to take in… and a striped one too! 800 sheep!!! Although deer are too plentiful, we are just not skilled enough to know how to hunt them, let alone dress them – another level of learning (even if just to be a lacky for someone else one day) – and I don’t trust myself to handle a gun safely, so the big stick (along with my ‘big’ husband) will be very much on hand instead, when I want to ‘wander’ at night..and perhaps we’ll keep that campfire going overnight too… So much food for thought; and soooo much to learn. Thank you for such an informative answer too. And this guy lost those sheep just out of Omeo. 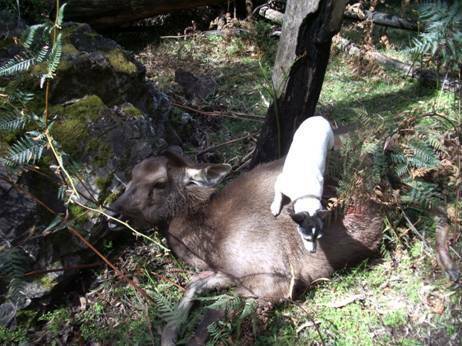 Wild dogs have become so bad there are pretty much no sheep left in the High Country any more.You can do a deer hunting course with the Australian Deer Association which will teach you all these things. They also have many publications. If you are going to have a campfire, have one just outside your tent as in my Deer Hunters tent. Cheers, Steve. We stayed at Wonnangatta this past Summer – so beautiful – and were woken one night to what sounded like a pack of dingo’s howling. We wondered how dangerous they are (it was fairly unnerving hearing them) – and whether we should be concerned or take any precautions, as there is next to no information on the internet about these dingos – and no recent photos at all. Do you think they could be dangerous, including if I walked off for a loo visit (I am about the size of your wife) – or even just wandered a bit to explore on a moonlit night? Do you think they would even walk into camp – and do you think a campfire is a help to deter them? Thank you for this write up – there is so much I am learning from all your posts. Thank you again Jenny. There is some aerial baiting in October but not much inside the National Park itself so their numbers are increasing. I always have a rifle and a fair supply of ammunition – also a machete. They are becoming more dangerous I think. Sometime they will attack someone, probably a child or smaller person alone, as you suggest. The problem is they have become mixed with all sorts of dogs. Very few are golden any more. There are lots of motley blacks and tans (I have seen one with vertical black and gold stripes!) – and they have all sorts of voices, different to what they were like in the past. I have a client who lost 800 sheep in a single night to these wild dogs. If you saw what they do to sheep you would be justifiably scared. Torn to pieces, and so quickly. A campfire will help. Of course I almost always go there in the colder months or canoe the river so have a camp with the river at my back. I would not recommend wandering off by yourself unarmed particularly after dark. They have much better eyesight than us. Carry at least a good stout stick and be ready to stand tall and make a lot of noise. Why not obtain an Authority to Hunt deer (there are plenty of them, and they are tasty!) and a Firearms Licence – and a gun? This will be good protection against other types of vermin who might endanger you elsewhere too. I do think that a woman alone has more chance of being attacked by a man in the city than by a dingo in the bush – and less chance to defend herself. I know that’s not a very PC thing to say. Cheers, Steve.